Oil of clove is and aniti-inflammatory, anti-microbial, analgesic an anti-fungal. The clove comes from an evergreen tree with pointed leaves. It is native to the Molucca Islands, and grown and cultivated in Madagascar, Indonesia and the Island of Zanazibar off Tanzania. 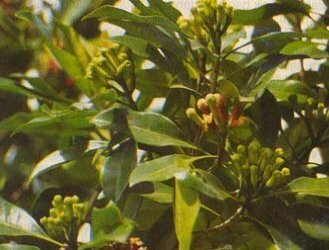 The oil is extracted from the leaves and the flowers and is the main form used in herbal medicine. The fresh and dried flower buds are also used in traditional Chinese Medicine. Bell's Palsy, Chronic fatigue syndrome and herpes. Increase the effectiveness of acyclovir(Zovirax), an anti-viral drug. Food poisoning. Kills common bacteria associated with food poisoning such as Pseudomonas sp.,Shigell, Staph. aureus, Strep. pneumonia. Periodontal disease and toothache. Botht eblossoms and the oil relieve pain of toothache. Peptic ulcer. Oil of cloves reduces the sensation pressure in the stomach. Does not actually reduce the gas, but blocks the nerve impulses transmitting the sensation. The oil can be combined with zinc oxide to make a paste to use in dental treatments. Clove oil should be avoided in root canal work since it may cause inflammation. Do not give to children under the age of six since it can cause gastric upset. Do not use the pure oil as it is very strong and can cause irritation. Dilute it in water or in olive oil. Read about more herbs at the Herb Dictionary Online.